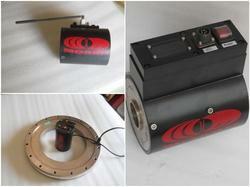 Telemetry Rotary Torque Sensor is a Precision torque measurement tool. It is essential in engine and transmission testing, turbine testing, pump testing, and testing of gear trains and power measurement within propulsion systems. Monitoring torque can be critical to optimizing the design of axles, drive trains, gear drives, and electric and hydraulic motors as well as gas and steam turbines. In short, if it rotates or spins on a shaft, spindle or axle, it creates torque that can be measured. Therefore, it can benefit from improved, more accurate torque measurement. Telemetry Rotary torque applications currently utilize traditional flange drive and keyed shaft drive torque sensors. As testing requirements demand higher frequency response, simplified installation and reduced down time associated with bearing wear. With the technology incorporated in the Monad Telemetry Torque Measurement Sensor, the industry has evolved from slip rings and bearings to the digital age. As the latest technology for torque measurement, digital telemetry can provide these advantages for end users and manufacturers of dynamometers and test stands in transportation, aerospace/defense, heavy equipment, wind energy, and industrial or factory automation applications. Looking for Telemetry Rotary Torque Sensor ?